Gertie's New Blog for Better Sewing: Swatch Time, Part Two! Readers, you were so helpful with your input on my fabric choices for the wiggle dress/overskirt combo pattern. Thanks to you, I've narrowed it down to three finalists for the overskirt, which I wanted to show you with fabric options for the wiggle dress. So first off, we have the fleurs, which were quite popular with you ladies. At Paron's I found this blue rayon shantung, which I think is the perfect shade of blue to match. However, I have to say, I'm hesitant about this one. I think it looks too heavy or something, and I think there needs to be some small sort of contrast between the dress and overskirt. Then, we have the tulle with flocked velvet polka dots, which would also match the electric blue shantung. I rather like this! I think there's just the right amount of contrast between the two fabrics. Finally, there's the embroidered black flowers on ivory illusion. I would pair this with a black fabric with some body like shantung or taffeta. I'm showing it here with a black crepe de chine for effect. Again, I like the bit of contrast that would set the skirt off from the dress. So. What do you think? I'm drawn to the vivid blue (particularly the dots, I think), but I worry that the effect will be a little Violet Beauregarde from Charlie and the Chocolate Factory ("It happens every time; they all become blueberries."). The black could be chic - I could use an LBD anyway. But is it not dramatic enough? I'd go with the first one, personally. I do get what you mean about drama, however. To that end, taking it into consideration, I'd go with the black combo, and then you can add a high contrast by adding something like an ivory satin waistband/bow to the overskirt. Tricky. I like the black set, and because the illusion is Ivory I don't think this would look too dramatic. On the other hand I love the shade of this blue shantung (de préférence avec les petites fleurs)! But I must admit that about this dress, my main concern is: will you make the matching cropped jacket? I'd love to see that, because it would make two very different outfit with the same basis (a sort of clothing case of Dr Jekyl and Mr Hyde). Oh, really, black is my favourite. Oh yes! I forgot to mention that I WILL be making the jacket, so this will be a whole ensemble. i love the blue too, but i think it's to much for a whole ensemble. i generally think clothing that invites comparison to fruit is to be avoided. and while I normally think black can be boring, in this case I think it would be wonderful and dramatic and totally wearable. So I vote for the black, but understand if you do the blue. Wow, this blog makes me want to bring my sewing machine to work. I like the black, I have to say. You would never just be part of a sea of LBD's in that dress - I've really never seen anything like it! Also, you still have that evening dress coming up, right? The blue is so flattering - maybe it can make an appearance there. Can't wait to try to make your gathered skirt this weekend! I don't like the 2nd one, with the polka dots. I think that would be a bit too Barbie outfit or such. I like the first one, but I can understand how it might be too much blue as well. The black is probably the safest colour, in terms of wearability and comfort in the outfit. But I'm not a fan of the sheer/black outer fabric...that is however, fairly easily replaced if you decide in the end it isn't a good match. I still like the blue the best -- having once had a heavy lace overskirt myself, I want to point out that it will never look the way it looks here -- the overskirt will be standing out quite a bit from the slim skirt underneath and a lot more light will come through than you probably think. I think the other two are too sheer, and when made up into the skirt will seem too insubstantial. Perhaps you could try draping these -- do you have a doll or doll-size dress form? or, okay, how about a toilet paper tube? try wrapping the underfabric tightly and then gathering the lace swatch into a pouf so you can get a better idea how it will really look. I like the second one. Out of all them, I feel like it is the less 'safe' one. You have great taste. It is a hard decision! I have to agree with you on the first one--although the flowers are my favorite, I don't see it for a skirt. Rather I picture the flower overlay as a beautiful bodice!~You just need to make another dress with it! For this pattern, I love the blue, and the dots are so fun! Although, if you need a lbd--I have stop b/c I am not much help! You can't go wrong with your choices. I actually don't mind the first. The polka dots are just great, but seem almost a bit lost on the blue. And the last one, while it might be a classy, almost seems underwhelming to me... So... I almost wonder about putting the last one over ivory for a little more contrast. Did you try putting the black over the blue, or the blue over the black? Just curious. I really love the first one. The blues can really lend themselves to many work and social occasions. And the black/grey option in number three seems like it may be too dressy for anything but cocktail and formal wedding kind of wear. But maybe that's just me since I'm planning an outfit for a wedding this weekend. Ha! I still have to send you some pictures of my suit version of this dress. Sorry to be so lazy! Oooh. I like Catherine's idea of black over ivory. Though maybe you don't want a whole ivory dress. So many options! The black illusion is not as sheer as I expected, so I like it less than the blue options. Personally, I would do the blue because when I'm at work before 5 and before I added the overskirt, I would rather be in blue than in a LBD like everybody else. Ivory! Catherine, you've totally blown my mind. I can't wait to get home and try that swatch on something ivory. I like the blue flowers (and maybe on ivory as well?) the best. The blue dots is too Madonna circa 1983 for my taste. I wanted to say the black because just about everything I own is black. But, I am going to live on the edge and say go with the tulle with flocked velvet polka dots. I'd put the blue polka dot over black. That way you get a sort of LBD, and a bit of drama. My opinion is the same as Sarah, you really want the more dense design. Otherwise, I believe the finished product might look too much like the Barbie version (which I had). 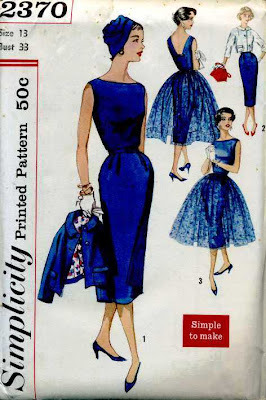 Remember, despite what we know because we can look at the pattern, the idea is that this will look like two separate dresses, not one with a temporary overskirt. Therefore, I think the first combo is THE one and I also love the fact that looking at the pattern you know exactly what you'll get, having matched the image so well. In fact, in a post a few days ago on my blog I showed a pattern from the 30's that had an ineffectual overskirt that I feel was caused because the fabric was not strong or dense enough (or in that case, even coordinated). I like the first one, the blue without polka dots. And thanks so much for the compliment on my post on Sew Retro. POLKA DOTS!!!! They had me at hello. All three are beautiful; you really can't go wrong. But I think I remember your saying that the black and les fleurs both had scalloped edges? If so, I'd use one of those because I ADORE a scalloped edge. And no hemming! Even better. I think my pick is for black, but please use that lovely blue shade for your evening gown :) Catherine's idea of black over ivory is especially appealing. If the ivory works, I'd be especially sold, and begging you to loan me the pattern next! Personally I like the black set better. POLKA DOTS! They're to die for! And so what if they're a "little Barbie"? You say that like it's a bad thing! I really like the black one the best. So pretty. Plus, you would get a great, versatile dress out of it, even when you decide not to wear the overskirt. I think I will wait and cast my vote after you have added the black and ivory options and paired the blue and black!!! You are going to be so stylish in this dress!! You must go ahead and make plans for wearing it, maybe a Christmas event. they're all lovely but i like the first and last options, the dots is my least favourite of the three. Personally, I adore the polka dots, but any of them will be wonderful. I can't wait to see what you make. I have to say, personally I think the way the 'ivory illusion'looks over the black is absolutely stunning. Also, obviously it depends on your own style, but I think black is much more functional, and you will be able to use the individual items of the ensemble with lots of different outfits so it will be much more useful! And you can't underestimate the usefulness of an LBD! You will look amazing either way though! But in black, not blue. That particular shade of blue is a bit much. I think the simple graphic nature of the dots will help offset the very vintage feel and keep it from feeling too fussy. I think the black is very elegant and the blue might look too costumey. I love the blue with the polka dots because it is so whimsical and not so evening competition! That's just my opinion, I'm sure it will come out beautiful whatever you choose! I rather like the polka-dots... just because it's so different... and polka-dots are fun! My second favorite is the grey/black/ivory look... I think it would be very elegant. I love the blue flowers over the blue fabric! I think you should make the blue polka dots without the jacket and the ivory/black floral with a jack. Both will be toooo delicious. Love the first one for this project, definitely jumps out at me.